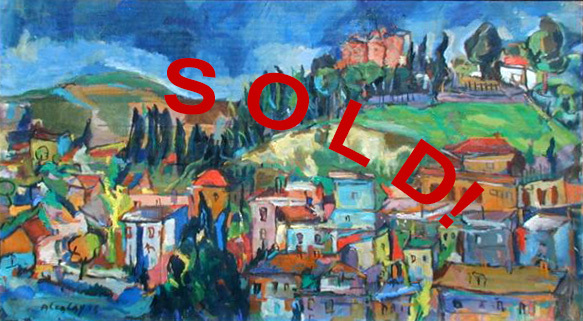 oil on hard board material, 26.75" x 15"
The hills outside of Rome, cypress trees marching up a hill in the middle distance, are the backdrop for the crowded town in the foreground. Rooftops and walls, punctuated by their windows, form a staccato scene of energetic form, brush stroke and color. Overarching this vibrant scene is an equally exciting sky of pulsating blue. This painting is in Albert Alcalay's early expressionist style, developed in Rome before he came to the United States. Architectural, angular forms are played against the curves of the hillside and the dancing forms of the trees. Buildings and nature, and the rich color palette are signatures of the painter.